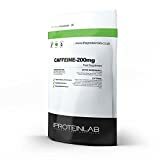 Caffeine triggers a range of performance-specific benefits including improved focus, elevated alertness, faster reaction time, reduced fatigue, increased endurance and elevated mood. – Manufactured in the UK Under strict GMO conditions. Caffeine works by changing the chemistry of the brain. It blocks the action of a natural brain chemical that is associated with sleep. As your neurons fire throughout the day, a neurochemical called adenosine builds up in your body. The nervous system uses special receptors to monitor your body’s adenosine levels. As the day wears on, more and more adenosine passes through those receptors-and it makes you sleepy. It’s one of the reasons you get tired at night. Caffeine, however, is a stealthy impersonator. It’s the same size and shape as adenosine, when you take caffeine, your adenosine receptors can’t tell the difference. Specifically, caffeine attaches to the A1 receptor. With caffeine docked at the receptor, a lot of your body’s adenosine molecules can’t enter. It creates a traffic jam of sorts. With all that adenosine blocked, the caffeine keeps you from getting tired.